[Editors’ Note: The following article was deemed “dangerous and derogatory” by Google.com, according to an authorized but anonymous notification. WorldTribune.com plans to update the article based on more specific feedback from Google along with responses from other responsible parties who contend they were endangered or disparaged. Such changes will be detailed in this Editors’ Note. 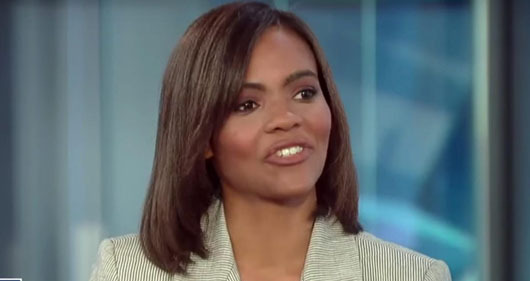 The Left’s treatment of Supreme Court nominee Judge Brett Kavanaugh shows that “radical feminism is one of the biggest problems facing our society right now,” conservative commentator Candace Owens said. “This toxic feminism – they want to talk about toxic masculinity, but that’s all Saul Alinsky’s Rules of Radicals – they point the finger at men, but it’s actually women, right now, doing this to society. Women standing up saying, ‘We’re going to take power by taking down men,’ ” Owens said in an Oct. 2 interview on SiriusXM’s Breitbart News Daily. Owens rejected Christine Blasey Ford’s allegations against Kavanaugh. The Turning Point USA spokesperson also weighed in on the response to Kanye West’s recent appearance on Saturday Night Live where liberals savaged West for reiterating his support for President Donald Trump. Owens highlighted actor Chris Evans’ denigration of West as illustrative of how “white liberals” view blacks as their political property. “Nothing pisses white liberals off more than finding out that “their blacks” refuse to behave the way they want them too,” Owens tweeted.